Ciutat Vella is the main old district of the city of Barcelona, composed of four highly populated neighbourhoods, which are El Raval, El Gotico, Santa Caterina de La Ribera, and La Barceloneta. These neighbourhoods are characterised by having a distinct narrow streets urban fabric than the rest of the city, therefore they operate differently. Each one of them contains different combinations of city administration buildings, service facilities, historic touristic attractions, commerce, and housing. These combinations are not evenly distributed, making different issues unbalanced between them throughout the district. 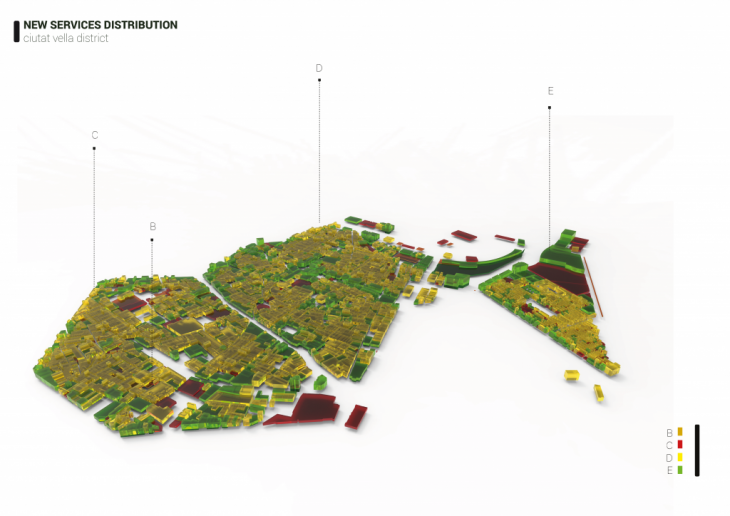 The task given parts from the idea of increasing the population in the area and with it, the redistribution of the different service facilities, and the increase of productive areas, taking into consideration an ideal balance between housing and activities inside each neighbourhood. For this task, certain assumptions were made like the full pedestrianisation of the district, the availability of all the city administration offices to become something different and the possibility to inject new activities where needed. By analysing the big data of this complex district, new discoveries were made. The driver of this project then turned into trying to supply or cover the current public services needs of each neighbourhood by transforming strictly all the current available areas from the city administration offices. By doing so, the lack of services would be covered on 15%. The term mixitè postpones to a project strategy, by now consolidated in the contemporaneity, turns to the creation of a net of relationships and transversal bonds among functional, social and morphological aspects. To pursue the functional mixitè means to plan an “anti-zoned” city, a plan that stimulates the synergies and draws the benefits from the phenomena that are able to produce on the territory owed to the integration of different activity. “Mixity” could be a keyword for urban policies. The aim is to encourage the presence of people from different backgrounds within the same territory, in the same neighbourhood, in the same housing unit. Having accomplished to improve the public services supply, the concept of “mixity” was introduced in the project to create an even distribution of housing, office space, industry and commerce throughout all the district. This totalitarian concept would allow for different results if the percentages of housing, office space, industry and commerce were put in the game. “Mixity” was planned to be introduced in a vertical manner, in which these different percentages varied according to the number of floors, underground parking, and street available parking for all the plots. With this vertical mix in place, population’s housing would increase, and activities would be spread evenly in each neighbourhood according to strictly to their built areas capabilities without having to build in addition.